Desk Report: Private launch owners started 15-day special launch services from Dhaka yesterday (18 August) on the occasion of Eid-ul-Azha. The 22 triple-deck private launches will ply direct from Barishal River Port and 8 others will ply via Barishal launch station continuing this service on Dhaka-Barishal-Dhaka route till September 1. Saidur Rahman Rintu, vice president of Barishal Launch Owners Associ-ation and owner of Sundarban launch fleet, said this year at least 22 triple deck launches including day-trips of vessels MV Green-Line and Adventure will ply on Barishal-Dhaka-Barishal route. 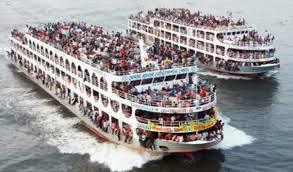 If the pressure of the passengers would be high, then they will arrange double trips of the vessels from each end on three-days before and three days after the eid from each end, Rintu said. About the fare for single trip journey on Barishal-Dhaka route would be same as fixed by the government rate like Tk.260-280 for deck, Tk 600-800 for sofa per seat, Tk. 1200-1500 for single seated cabin, Tk 2200-2500 for double seated cabin. Besides double seated semi-VIP cabins would be Tk. 2800-3000 and VIP cabins would be Tk 6000-10000 according to the conditions of A/C, attached bath and privacy, Rintu said. On normal day 4 to 6 launches give daily trips from each end and passenger have to pay per head thirty to forty percent less fare than festival period trips for one-way of the route due to hard competition in attracting least passengers, Rintu acknowledged.